Let’s look at our localized country versions first. You may know that each localized country version comes with the enabled language, currency, date format, further country-specific fields, picklists, validations, and with a sample organizational, employee and pay structures, etc. Depending on the requirements of the countries, we add further country-specific configuration. To serve our customers in Japan and South Africa, I am happy to announce that we built SAP Best Practices for them. The localized content is packaged as configuration items and can be deployed via SAP Upgrade Center. The country version for Japan includes localized configuration for EC Core, Dependents Management and the Integration with EC Payroll. Time Off configuration is not yet available, but the team is working hard to make it available with the next release in 1905. The country version for South Africa includes EC Core, Time Off, Dependents Management and the Integration with EC Payroll. Worth mentioning is certainly that the indirect valuation of pay components is configured as part of EC Core. For Time Off we deliver the configuration for the 3 years sick leave requirement. Besides those two new localized country versions, we have enhanced the existing ones as well. Brazil: Enhanced pre-configurations for EC Core where we added a Business rule where changes of the employee need to be done on the first day of the month. This is relevant for Comp Job Info and Payroll Information. Canada: EC Core: added country specific pay components, for Time Off: country specific Time Types, added scope items for Dependents Management and Integration with EC Payroll. Spain: Added Indirect Valuation as part of EC Core, as part of Time Off we enhanced country specific sickness time types, annual leave for working and natural days. Switzerland: For Switzerland (CH) we enhanced EC Core. In the coming release we plan to deliver Time Off as well as the Integration to ECP. United States: as pat of EC Benefits for US, we enabled Flexible Spending Account (FSA), FSA Limited, Health Saving Plan, Dependent Care for open enrollment. You may have recognized that we slightly changed some scope item names and adapted the scope item grouping a little bit. I’m sure it is now even more comprehensive. 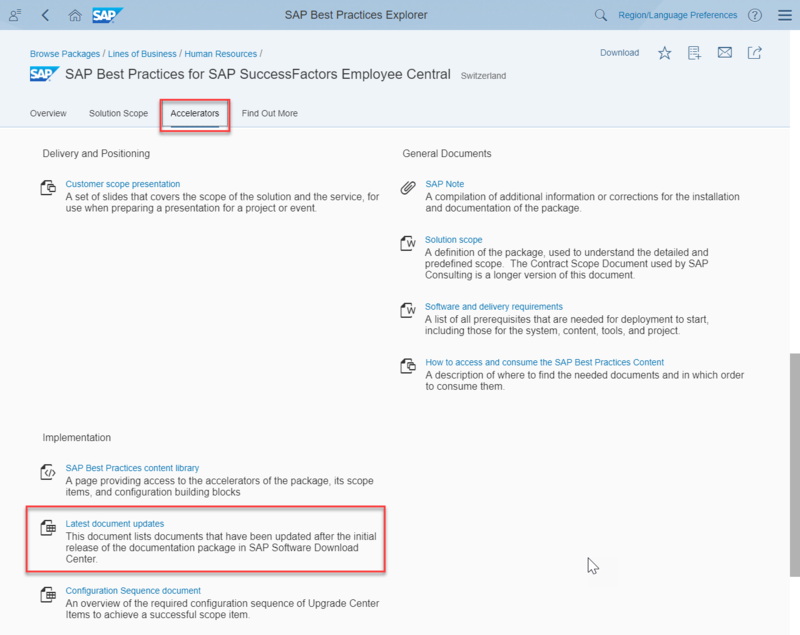 Customer can deploy this SAP Best Practices Document Generation on top of EC Core as a separate Configuration Block via SAP Upgrade Center. Once deployed, an HR Administrator can generate these templates either via Actions in Employee File or via Admin Center.